My Totally Unnecessary Cocktail Dress is made from a polyester/elastane satin, and as I wish it wasn’t stretchy (I’m shopping from stash here! ), I’m underlining it with organza to make it stable. 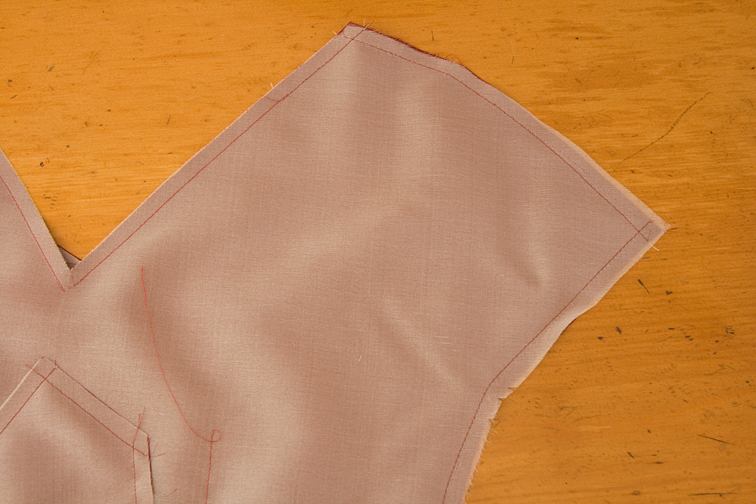 The Burda version (#125- 11-2007) uses silk duchess satin which has zero mechanical stretch, and I’m hoping I can make my fabric behave in a similar manner by underlining with silk organza, which also has zero mechanical stretch. To ensure the pieces are identical, I cut the fabric and organza together – lay the organza on top of the satin, chalk around the pattern, and cut both layers together. It is less accurate to cut both pieces on the fold, especially when using fabrics of different thicknesses, as the fold itself takes up millimetres. I am always careful not to cut silk duchess satin on the fold, as the foldline can leave a permanent crease – not great down the CF of a gown! So now the front, back and sleeve gusset panels are all underlined and I’m ready to proceed with the rest of construction. 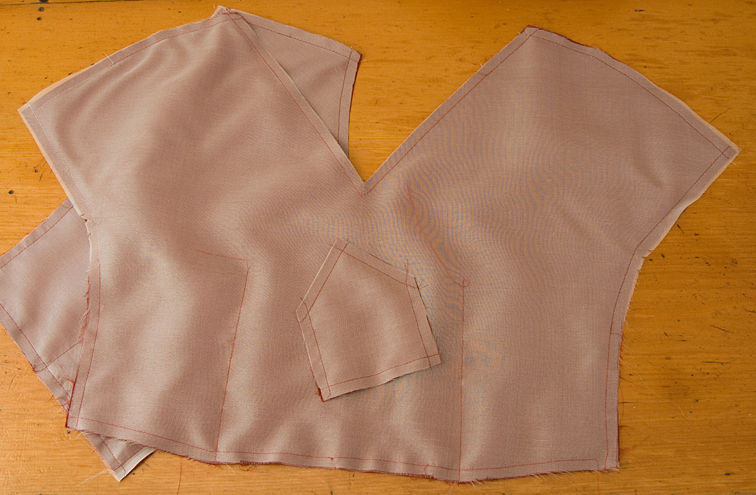 I sewed the darts next – I think it is easier to sew darts while the panels are still flat, Burda instructs you to do it after the sleeve gussets are inserted, I’ll let you decide! Next up – the kimono gussets! I'm a designer/patternmaker who loves to share my sewing knowledge with others! Follow me as I sew my personal projects, sharing my favourite tricks of the trade along the way. I'm planning to underline not one but 3 projects in the future for the first time, so this post was very timely. me too, I am working on a short wedding dress out of kimono silk, so this is really helpful. so useful to know – I have only underlined once in my life, and I followed my trusty Reader's digest guide. It wanted you to adjust every piece for turn of cloth so I'm interested to see that you find that unnecessary – this dress is going to be stunning! Between this post and the button loops, you seem to have a direct line to my brain. Thank you for your clear explanations and your fantastic mindreading powers! This is going to be one stunning dress (and as one who has frequently made unnecessary items of clothing, I completely understand your NEED for it!). I've only ever used silk organza underlining once (my sister's wedding dress) and it was fabulous, but it's not cheap here in Dunedin (last time I saw it it was $30 per metre) so I don't use it. I've used ordinary lining, wincyette, lightweight cottons, various interfacings, that type of thing, and I'm curious to know what else you might use if you didn't have the silk? Thank you, thank you, thank you, I appreciate anything like this that helps improve my technique. I think I should join the Burda Addict blog, LOL! I am just finishing today, as a matter of fact, my first garment that is fully underlined. It is not a very good garment, just a sun dress in light yellowr, but it is shear and I could not see having to wear a slip all the time. So, I tried the underlining with a off-white cotton. 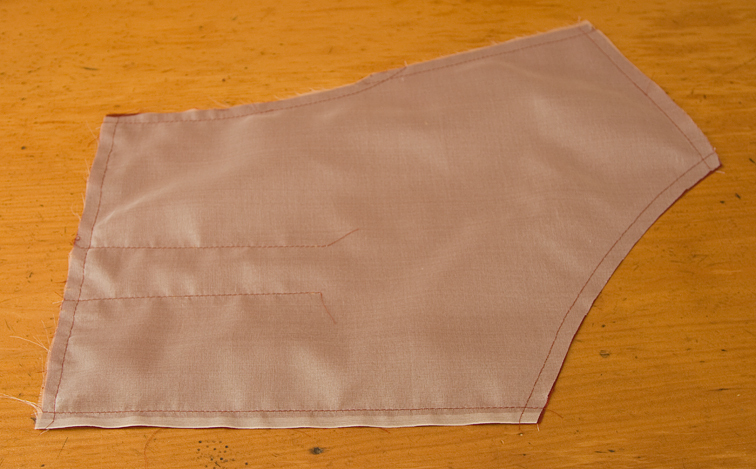 I am glad to see that I cut it out right-with both fabrics together-and I basted only one side of each piece. Lazy. Seems to be fine. I really didn't know what I was doing, so I am glad it turned out all right. I will post it on my blog in a day or two. Now, if summer would only come soon. Are you going to insert or understitch the gusset? As i commented on the previous entry, I already made that dress. But that time I understitched it. Now that i “rediscovered” the dress on your blog, I want to make a “non-party” version of it! The fabric I am planning to use is a bit thick for understitching, but I wondered how to insert the gusset since there is technically no seam allowance on those pointy “cut outs” on the upper bodice pieces (while there are regular seam allowances on the gusset piece). Looking good Sherry – can't wait for the next class! Any chance of moving to Melbourne and giving me some specialty technique lessons!? Thanks for another great informative post. I'm very interested in your response to Judy about alternatives for underlining. Silk organza is not cheap in Adelaide either! I've used polyester organza as it seems to have similar non stretch mechanical properties to silk organza (but is about less than half the price), but I wonder if I am committing a heinous sewing crime every time I use it. How does silk organza wash? I really like not having to dry clean garments, especially if the top fashion fabric is washable! BTW I love that cocktail dress pattern! Hello Sherry . I love this, its so timely for me and my “glamour puss “dress. I was wondering if you would ever underline with polyester organza . It seems to have alot more “spring ' in it than silk and I guess I wondered whether you have any reservations with mixing a synthetic and natural fibre . I will iunderline in silk organza , I guess i was just wondering? That is certainly one stunning cocktail dress pattern so I am looking forward to seeing your finished product! Really Great information here, as usual! Sherry, I just heard there was an earthquake over there, hope you are okay. ~MaryNanna – it really is turn of cloth that you are adjusting for in most instances, my fabric is stretchy so I'm just taking an intelligent guess! There's always unpicking…lol! ~Judy – I think you can use any tightly woven fabric as long as it is lighter weight, works well with the shell fabric, and gives the effect you want. ~lakaribane – I'm not surprised you remembered this stunning dress! ~Chrissy – This would look amazing in emerald! I inserted the gussets from the inside, I'm not sure about understitching them – is that the same as topstitching them from the right side? ~Sewingelle – I've never used polyester organza, it doesn't have the crispness of silk organza, plus I just don't like polyester! You can preshrink silk organza by washing it first, but it is usually used in special occasion garments that require dry cleaning anyway. ~Mem – I think it is better to use the same fibre content as they will behave similarly when pressing and cleaning. ~Vintage Girl – I'm fine in my part of the country – but unfortunately many have died in Christchurch 😦 It's very sad, thanks so much for caring. Hi Sherry, I'm glad to read in the above comment you are OK. Such terrible news. It's horrific how many people have been affected by this. I appreciate the great tips for working with satin and organza. I'm sure I will find them helpful in the future. Thank you so much for wishing me congratulations on my pregnancy. I will try to get some baby bump pictures posted in the next week or so. Olá, seu tutorial é claro e perfeito, obrigada, mal posso esperar para ver o vestido pronto. What happen if you use Silk organza as your fashion fabric, what will you use as underlining and lining a silk organza dress? Hi, I'm Sheryll! I am a designer/patternmaker who loves to share my sewing knowledge with others. 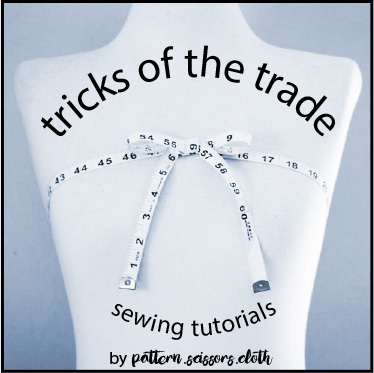 Join me as I sew my personal projects, sharing my favourite tricks of the trade along the way. The Ruby Slip - Free Pattern and Sewalong! Everything I have written and photographed is for personal use only, so I’d really appreciate it if you didn’t republish or redistribute my work in any way.